Last week, my Boyfriend and I went to Amsterdam for a short getaway. We were very curious to see what Amsterdam had to offer. Here are some of the highlights of our trip. First, we took a tour of the canals; this way you can get a general picture of the city. We were immediately smitten with the charming houses and all of the bicycles. The romantic outline of the city means you can stroll around for hours, discovering quaint little shops and corners as you go. 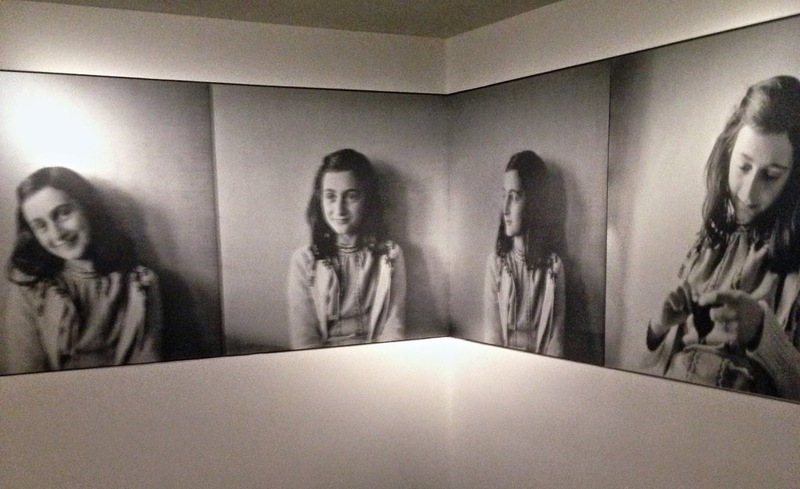 Number one on my to-do list was the Anne Frank House. I read her diary when I was thirteen - Anne's age when she started it - and really related to her way of thinking. She was such a bright girl, filled with opinions and self-criticism. The three-hour line was mind-boggling, but worth the wait. I bought her bundled diary, 'Het Achterhuis', right where she wrote it. (This still gives me chills). Our last hours were spent visiting the Rijksmuseum, which holds an impressive collection of art from the Middle Ages until present day. I especially wanted to see Rembrandt's 'Nachtwacht' ('Night Watch') with my own eyes, since it is one of my favorite seventeenth century paintings. We had such a lovely trip and I cannot wait to get back one day to enjoy this lovely city once more. Outfit: Zara Dress (£19.99), Sunglasses from a little street shop in Lisbon. Makeup: Urban Decay Naked Basics Palette (£22.00), Bourjois Happy Light Foundation (£11.99), Bourjois 1 Second Volume Waterproof Mascara (£9.99), Benefit Rockateur Blush (£23.50), Dior Lip Glow (£23.50), Nars Creamy Concealer in Vanilla (£22.00), Real Techniques Buffing Brush (in the Core Collection for £21.99), Ecotools Retractable Kabuki Brush (£12.99), L'Oréal Eyebrow Pencil (£3.00), Rimmel Stay Matte Powder (£3.99), The Body Shop Honey Bronzer (£13.00).